The Flower Kings, “The Truth Will Set you Free”: One of the superlong Flower Kings opuses – in fact, the first thing by the Flower Kings that I ever heard. Solas, “Pastures of Plenty”: a stunning version of the old Guthrie song, played by one of my favorite Irish bands. It’s a brilliant cover – the original song is clearly there, and yet its embedded in a reel. I’ve heard in a very long time. Highly recommended. to love his stuff with ELP. But then ELP fell apart; he tried to bring it back a couple of times, with results ranging from mediocre (Emerson, Lake and Powell) to piss-poor (Three). Then he went off to do mediocre movie soundtracks. And now, he’s back with a new prog-rock band. And they’re good. They’re not ELP, but they’re better than any other post-ELP work that he’s done. Sean Malone, the genius behind GK. They’re really excellent. music. Very interesting stuff. Not my favorite, but definitely very cool and well worth a listen. I suspect it will grow on me with time. Van Der Graaf Generator, “The Sleepwalkers (live)”: Wow. John Corigliano, “Fantasia on an Ostinato”: Corigliano is one of my favorite modern classical composers. This is an intimate little piece for solo piano. Very beautiful, very stirring, and yet very delicate. And as a special bonus, this irresistible video of two dancers playing Bach’s Tocatta and Fugue on the giant piano at FAO Schwartz. This entry was posted in Music on May 29, 2009 by markcc. data structure: it’s superimposed on it. and properties intact, and to augment it with a tree that lets you search it efficiently. 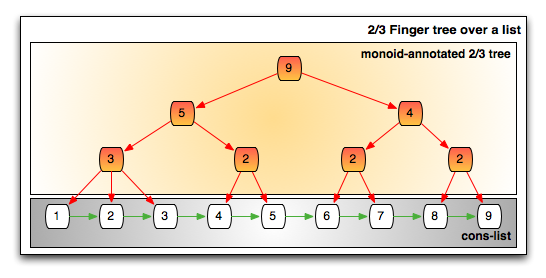 monoid annotated tree is a finger tree. genius of the finger tree. This entry was posted in Data Structures, MarkCC's Errors on May 28, 2009 by markcc. stopping an imperative-language programmer from using them as well. binary search to find names, and I could find any name in no more than 16 comparisons – and the whole shebang would be contiguous, so I wouldn’t even be chasing pointers. of the traditional cons list, and the search efficiency of the array based method. This entry was posted in Data Structures on May 27, 2009 by markcc. that because it would get me in trouble, but rather because I spend enough time on work, and blogging is my hobby. But sometimes there’s an overlap. One thing that’s come up in a lot of conversations and a lot of emails it the idea of cloud computing. A lot of people are interested in it, but they’re not really sure of what it is, or what it means. 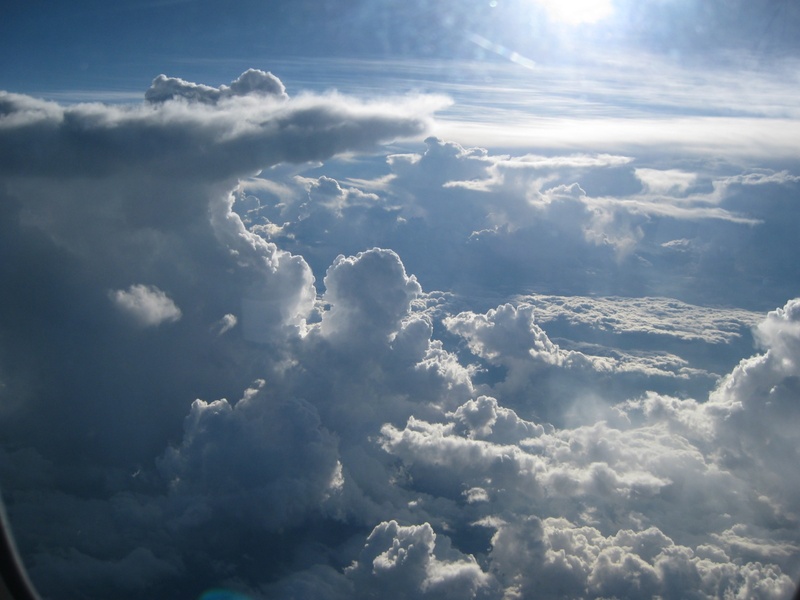 So what do we mean when we talk about “cloud computing”? What’s the cloud? How’s it different from good old-fashioned client/server computing? This entry was posted in Computation, Coolness, Programming on May 20, 2009 by markcc. Numbers are, obviously, very important. And so, over the ages, we’ve invented lots of notations that allow us to write those numbers down: the familiar arabic notation, roman numerals, fractions, decimals, continued fractions, algebraic series, etc. I could easily spend months on this blog just writing about different notations that we use to write numbers, and the benefits and weaknesses of each notation. make sense, we have to start at the very beginning: What does it mean for a number to be describable? This entry was posted in information theory, Numbers on May 15, 2009 by markcc. substance of my critique, and resorts to quote-mining. then pretend that you’ve addressed everything. This entry was posted in Debunking Creationism, Intelligent Design on May 11, 2009 by markcc. both incredible technical virtuosity and real feeling. decent stuff just by itself. But then Ricci is a nearly supernatural harmonica player. special track, but not bad. Marillion, King Crimson, and Porcupine Tree. very much in the “godspeed” vein. Really excellent stuff. poppy-end of neo-progressive. If you like Marillion, there’s a good chance you’ll like these guys. In particular, they’re good at the same kind of wonderful transition that Marillion is known for. Steve Hackett, “Omega Metallicus”: Hackett is always terrific. like a bunch of pikers, just put on the Flower Kings. This entry was posted in Music on May 8, 2009 by markcc. So. William Dembski, the supposed “Isaac Newton of Information Theory” has a new paper out with co-author Robert Marks. Since I’ve written about Dembski’s bad IT numerous times in the past, I’ve been getting email from readers wanting me to comment on this latest piece of intellectual excreta. I can sum up my initial reaction to the paper in three words: “same old rubbish”. There’s really nothing new here – this is just another rehash of the same bankrupt arguments that Dembski has been peddling for years. But after thinking about it for a while, I realized that Dembski has actually accomplished something with this paper: in his attempt to argue that evolution can’t possibly outperform random-walks without cheating, he’s actually explained exactly how evolution works. He attempts to characterize that as cheating, but it doesn’t work. This entry was posted in Debunking Creationism, Intelligent Design on May 7, 2009 by markcc. to go on television and say this. Anyway… Wagner claims that the LHC could destroy the earth. See, there’s a tiny theoretical chance that the right collision in the LHC could create a microscopic black hole. According to Wagner, if that happens, the black hole will swallow the entire earth. energy of any collider that we could ever build on the earth. take a look at what he says. When asked what the probability of the LHC destroying the earth is, he says 50%. Why? Because either it could happen, or it couldn’t – therefore, there’s a 50% chance of it happening. which you can use to update your probability estimate. This entry was posted in Bad Physics, Bad Probability on May 3, 2009 by markcc.